How many times have we heard the term “Superfood”. Superfoods are nutrient rich foods that are considered to be especially beneficial for health and well-being. WHY ARE WE NOT EATING THESE FOODS ALL THE TIME? 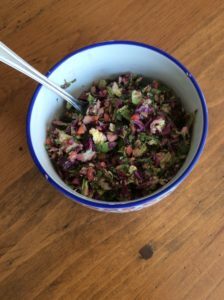 This Rainbow Maple Lemon salad that I am sharing with you today has a whole pile of those nutrient rich foods all in one easy to make salad. Kale, almonds, lemon, sweetened with a touch of maple syrup are only a few of the ingredients you will be throwing into this one. 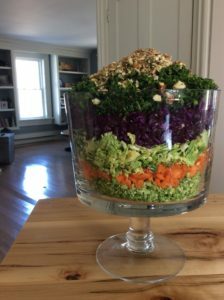 I love salads especially ones that I can make ahead of time, put the dressing on right away, able to store the leftovers in the fridge for at the very least a few days AND one the whole family enjoyed. This one has all that and more! Using a food processor, process all the veggies until finely chopped. Mix together in a very large bowl. This will need to be done in batches. Add almonds to the food processor, pulsing until coarsely chopped. Toss in the bowl with the veggies, adding the sunflower seeds also. In a small bowl (magic bullet or blender) whisk together all ingredients for the dressing. Taste dressing before drizzling over salad, adjust if need be. Let me know below how much you loved the Rainbow Maple Lemon salad or what you changed to make it your own.